What to do to get confirm rail ticket in vacation? What to do to get confirmed rail ticket during vacation? Do you know how to get confirmed rail ticket during vacation? Vacation is a peak time and it is very difficult to get a confirmed ticket for travelling. After reading this article, you would be able to get a confirmed train ticket without going to any railway station or to an agent. So, to know the procedure of getting a confirmed ticket, please read this article. We plan our vacation every year but we always worry about confirm ticket due to high rush in the train during summer vacation. Sometimes we do not get confirmed ticket and we force to either postpone or cancel our planning. In this article, you will find step by step procedure to get confirm ticket during vacation. Password of your choice. It should be a combination of alphabet and number. Name, surname gender, marital state, date of birth, occupation, Adhaar card number, PAN number, etc. You have to provide mobile number and email ID and also you have to verify both of them. After this submission of form you have to verify the mobile number by OTP and email by clicking the link sent by IRCTC to your registered email. After verification of mobile number and email, your registration will be completed with the IRCTC. 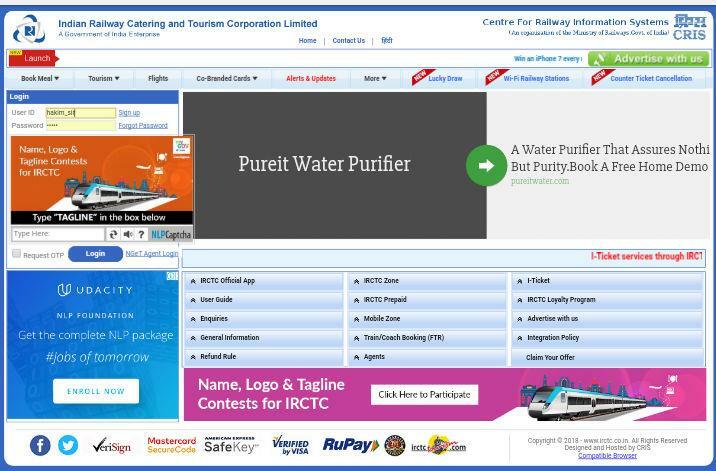 Visit the homepage of IRCTC and sign in with your user ID and Password. When you will sign in, a new window will appear on the screen. You will find a box, and you will be asked to enter the from a station to station and date of journey. Fill all the detail and submit. You will be provided with the list of different trains and classes. 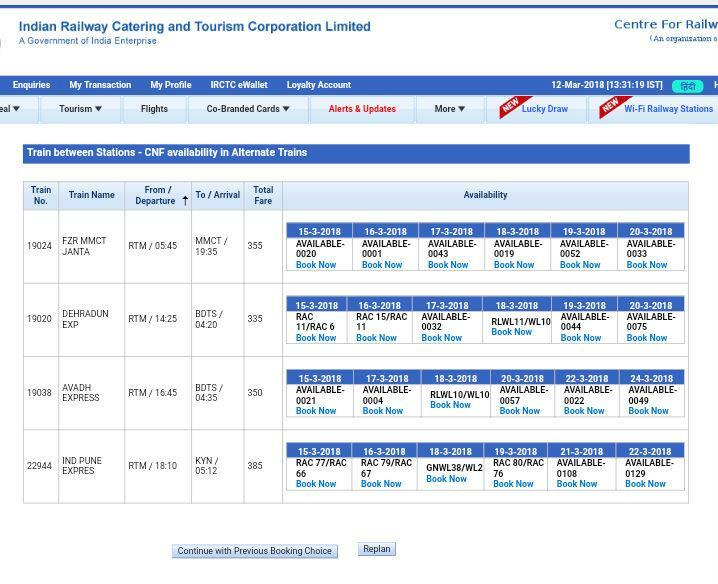 Click on the train and class of your choice and search the availability of ticket. If the ticket is available click on book ticket. A new window will open. Fill the passenger's detail like name, gender, age, proof ID, mobile numbers and enter the captcha. After filling all detail, you will be redirected to the payment page. There are many options for payment. You can pay through net banking, debit card, credit card, PayTm wallet, free charge, mobikwik, etc. Select your preferred method of payment and your ticket will be booked. You will also receive an SMS for the same. You can also take print out of the ticket. What to do if confirmed ticket is not available? Change the from and to station to find whether there is an availability of ticket between that stations. For example, if you want to travel from Ratlam to Mumbai, and the confirmed ticket is not available then change the from station Ratlam and fill Ujjain or Shamgarh and likewise change the to station Mumbai to Karjat or Pune. You will find different trains and in most of the cases the confirmed tickets are available . Also search train from origin station to last station. There are more chances of getting confirmed ticket between these stations. 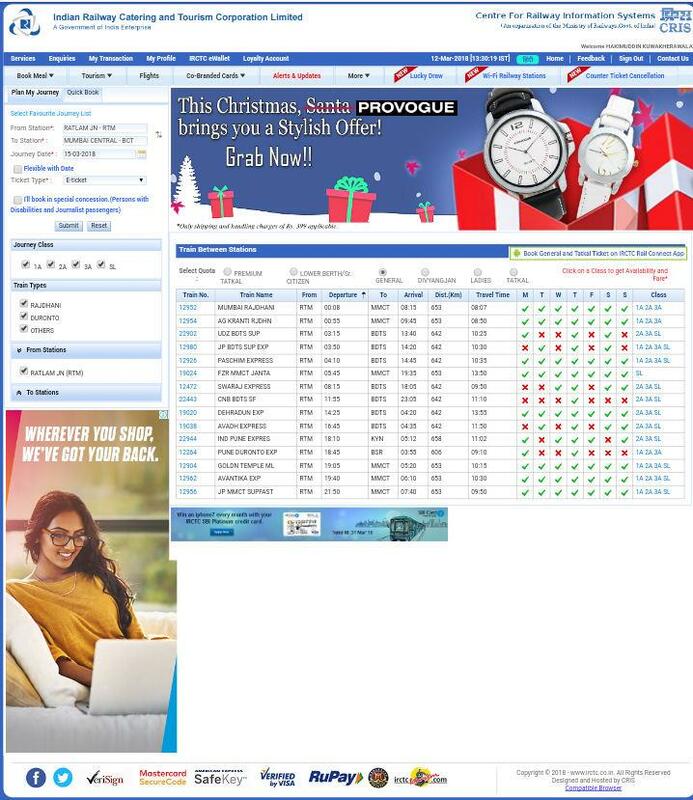 If ladies are travelling with you, you can search for ladies quota. Sometimes confirmed tickets are not available in normal quota but are available in ladies quota. You can go for tatkal ticket 24 hours ago. You can take the waitlisted ticket and check the option of the auto upgrade. There are good chances of ticket confirmation. If ticket will not be available in sleeper class and seats are available in 3AC or 2AC, then your ticket will be confirmed in that class without any extra payment. You can search confirm ticket in alternate train option. What to do if the ticket does not confirm at the last moment? Be cool: If your ticket does not confirm, do not show your anger and try to be cool. It will improve your memory power and you can think some new ideas to get the confirmed tickets. Try to contact T.C. : You can contact the T.C. of the train. Sometimes T.C. can provide you with the confirmed ticket by seeing their charts. For that, you may have to pay some extra money. Go to windows ticket: You should visit windows of railways to get the confirmed ticket. The clerk will check and tell you whether a confirmed ticket is available in any alternate train or not. If the ticket is available on the alternate train, then you can book this ticket. Try to book through passport :There is some special quota in railways and you can book through your passport and there are good chances of getting confirmed ticket through your passport. But you have to pay some extra charges for the same. 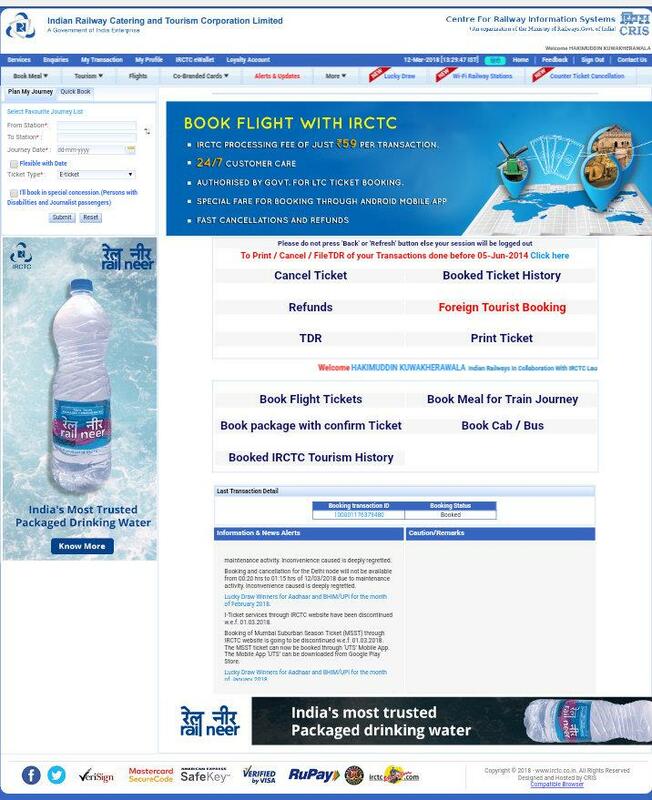 Alternate option: After trying all the above steps, if there is no chance of getting confirmed ticket then try to search other option of travelling. You can hire a cab, Volvo bus, by air, etc. There are some agents who can guide you for getting alternate means of travelling. So, dear friends, during this vacation book your train ticket without going to an agent. Agents take 300 INR to 500 INR extra in peak time and it is not possible that all the customer get the confirmed ticket. So, instead of consulting any agent book your ticket from your home. I will also suggest you plan your vacation before 2-3 months to get the confirmed ticket. If you plan earlier, you have higher chances of getting confirmed tickets. Most of the income of the bread-earner is utilized for vacation tours during summer holidays of their children. Vacations are always postponed by the elders due to the cost involvement. So here are a few tips to reduce the cost and enjoy with family. These days more and more youngsters are option for part time jobs during Summer Vacations for getting extra pocket money and work experience. For this reason part time jobs or 'summer jobs' have become more and more famous. These give students not just a source of pocket money but some professional job experience as well. In this article I will talk more about part time jobs for students.